This hands on course is for new or returning riders who want to get their license and learn to ride safely. We’ll teach you practical skills and techniques like; slow speed maneuvers, clutch control, cornering, avoiding obstacles and stopping quickly. These are lifesaving skills. This course consists of an online class through Motorcycle Safety Foundation which takes approximately three hours with a test at the end, the completion of the online course is mandatory with the completion certificate being required on the first day of the course. You will then attend an interactive portion of classroom at our facility for approximately five hours along with riding 14 different exercises on the motorcycle for approximately 10 hours. We provide the training bikes and you just bring some basic safety gear. 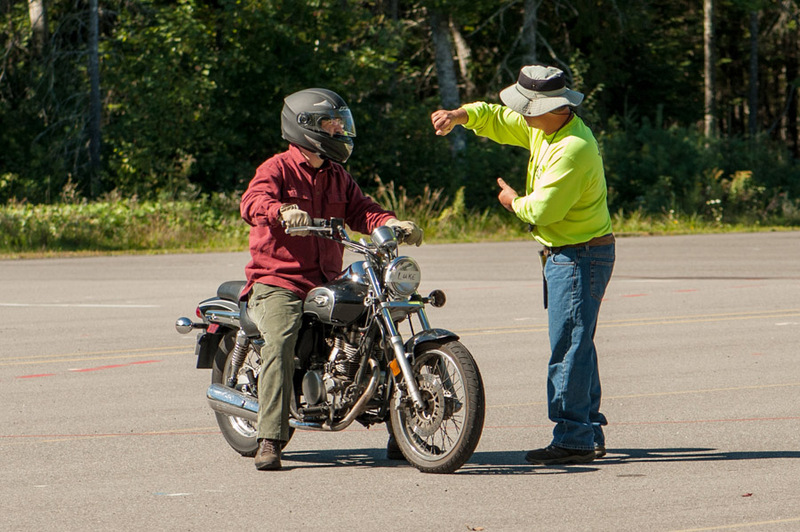 By passing the riding exercise evaluations and written test for the BRC at our range you will leave with a ‘Course Completion Card’ which will waiver you for the road test and written test at DMV. Just head to your local DMV where they will stamp your license with the motorcycle endorsement and you are licensed to ride! Discount Fee – $ 315 (Active Duty, Reserve and Retired Military personnel, Firefighters, EMS and Law Enforcement,Students as well as Start Touring Group members and United Bikers of Maine members) Please bring valid ID for any of the categories listed. Deposit – 1/2 of your course fee is required to reserve your spot- (the balance can be brought to the first day of class in cash or credit/debit card. Checks will not be accepted) Payment can be made over the phone with Credit or Debit card, mail a check or at the Paypal link. Confirmation paperwork will be emailed or snail mailed as soon as the deposit is received. We have a State mandated minimum student per class of four (4) and a maximum of twelve (12). If class minimums are not met you will be offered the next available date that is most convenient for you. To successfully complete the course students must score 80% or higher on the knowledge test and pass the riding skills evaluation given at the end of day two. Also students must be present for the duration of the class. Motorcycles are provided by A&J Motorcycle Safety School. Students must be at least 16 years old and must have parental/guardian permission if under 18. If you are between 16 & 18 and have your drivers license you must bring it to class or you must provide proof of completed Drivers education course. A & J Motorcycle Safety School reserves the right to cancel/reschedule class due to unforeseen circumstances. We provide coffee, tea and water. Books and course materials are supplied as well as pens, pencils and highlighters. Valid Drivers License – call in advance of the class if you are not a licensed driver. DOT approved Helmet (we recommend full face helmets for beginning riders) We do have some helmets to lend but please let us know in advance of class if you need to borrow one. All classes start promptly at the time listed in your confirmation paperwork. Ending times are approximate. Class may end early or run late, depending on student needs, weather or other factors. We attempt to schedule start times to take weather conditions into account. Occasionally your instructor may ask the class to adjust the start time of the next session to accommodate unforeseen weather (usually heat!) conditions. All riders must agree to the change. If not, the published schedule will be adhered to. You must be on time and present for the entire time that class is conducted. It is a requirement from the State of Maine that you are present for the entire class. Therefore, late arrivals will not be allowed to participate. Your instructor cannot ‘catch you up’. You cannot ‘ sit out’ an exercise. Please respect your fellow riders by showing up on time and being ready to ride for all sessions. If you are late and denied entry into the class, a refund will not be offered. Missing any portion of the class will be cause for dismissal. All the courses emphasize the risks involved with riding a motorcycle and these risks are present while a student practices during the course. Students who do not meet the minimum objectives, are unable to keep pace with the class or who pose a hazard to themselves or others, may be dismissed from the class by the instructor. If this happens there will be no refunds and no rescheduling without a fee. Also should you remove yourself from a class that has started you will not be given a refund. You must review our refund/cancellation policy and a class waiver that will be sent to you once you have registered and you will be required to sign these two forms prior to starting the class.